The Pantosteus plebeius-nebuliferus species-group is a group of freshwater fishes distributed in endo- and exorheic drainage basins in the Mexican Sierra Madre Occidental mountain range system and central North Mexico. The geological history of this region is considered an important factor in explaining the evolutionary history of low vagility animals like freshwaters fishes. The aim of this study was to examine the phylogenetic relationships and describe the evolutionary history of the species-group. We hypothesized that the genetic structure and distribution of the main clades of Pantosteus plebeius-nebuliferus are associated with the geological history of Northern Mexico. To this end, we obtained DNA sequences of mitochondrial and nuclear genes and performed phylogenetic and phylogeographic analyses. Divergence time estimation and ancestral area reconstruction were also carried out to propose a biogeographical hypothesis, and species boundaries within the species-group were also tested. We identified four clades within the Pantosteus plebeius-nebuliferus species-group in both markers. Divergence ranged from 5.9% to 9.2% for cytb and 0.1% to 0.9% for GHI. We observed significant genetic structure and no shared haplotypes between clades. 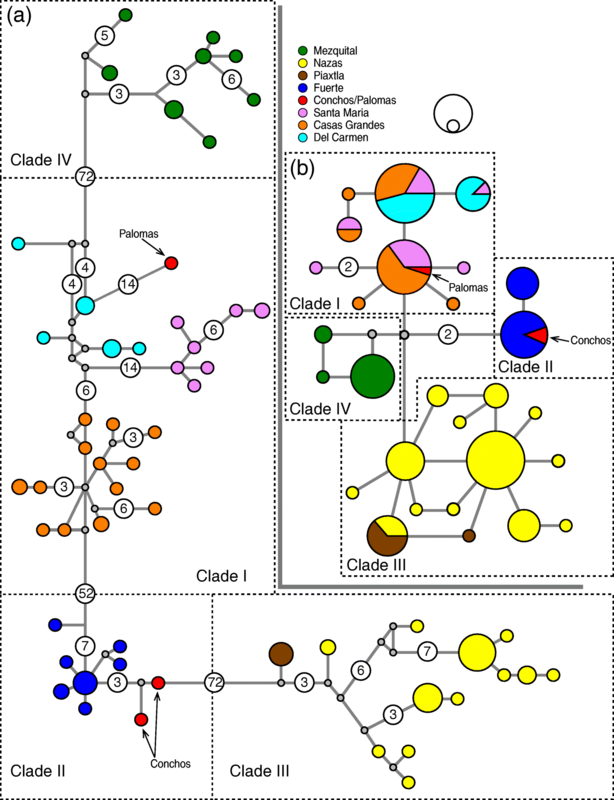 We estimated that the clades diverged during the last 5.1 Myr, with a biogeographic scenario suggesting eight vicariant and four dispersal events through the historic range of the species-group. We found that the best species-delimitation model is when four species are assumed, which correspond to the main clades. We identified nine evolutionary significance units (ESUs), pertinent to the conservation of the group, each representing populations present in distinct drainage basins. The evolutionary history of the Pantosteus plebeius-nebuliferus species-group is characterized by vicariant post-dispersal processes, linked to geological changes in the Sierra Madre Occidental and central Northern Mexico since the Pliocene. This is congruent with biogeographic patterns described for other co-distributed fish species. We propose a new phylogenetic hypothesis for the species-group, clarifying the taxonomy of this evolutionarily complex group. Our results suggest that the species-group consists of at least four clades with independent evolutionary histories, two of which may represent new undescribed species. Our identification of ESUs provides a basis upon which conservation measures can be developed for the species-group. The structure of current North American biodiversity is related to geological (tectonic and volcanic) and climatic changes that occurred mainly during the Neogene (ca. 33 Million years ago (Mya) and Quaternary (ca. past 2.5 Mya) [1, 2]. The Sierra Madre Occidental (SMOC) mountain range in Mexico is an area of high faunal and floristic endemism, and is considered an important biogeographic corridor . The formation of the SMOC during the Oligocene (ca. 33-23 Mya) until the present [2, 4] is an important factor influencing the evolutionary history of several taxa, particularly organisms with low vagility such as freshwater fish species [3, 5–12]. Although the biodiversity of northwestern Mexico is mainly related to tecto-volcanic activity of the Tertiary, the SMOC is also considered a Pleistocenic refuge, and associated with the expansion and contraction of the distribution of numerous species . The effects of climate changes on epicontinental waters has significantly affected the distribution of the fish fauna of this region . The evolutionary history of the sucker fish family Catostomidae in Mexico may have been influenced by these processes, especially in the case of the Catostominae subfamily, the predominant fish group of the family in Mexico . Within the Catostominae, two closely related species of the genus Pantosteus Cope & Yarrow, 1875; inhabit northern Mexico including the SMOC: Pantosteus plebeius (Baird & Girard, 1854) and Pantosteus nebuliferus (Garman, 1881) [14, 15]. Pantosteus nebuliferus has a restricted range, and is endemic to the endorheic Nazas and Aguanaval drainage basins. In contrast, Pantosteus plebeius is widespread and occurs in several drainage basins across the SMOC: the Mezquital, Piaxtla, Fuerte, and Yaqui basins; the Central Guzman hydrographic system (Santa Maria, Casas Grandes, and Del Carmen basins); the Upper Rio Grande basin (Conchos River in Mexico and Rio Grande River in USA); and the Mimbres basin in New Mexico, USA (Fig. 1) . Pantosteus plebeius is also distributed in the Gila River of the Colorado basin, but the origin of this population is uncertain, some consider it to have been artificially introduced [17, 18], while others suggest this population is the result of stream capture from the Mimbres River . As with other Pantosteus species in Mexico, P. plebeius is believed to have colonized several drainage basins during the postglacial period . Dispersal during anastomosis of rivers, followed by vicariance after river isolation, has been hypothesized as the main factor influencing genetic divergence among Pantosteus populations. 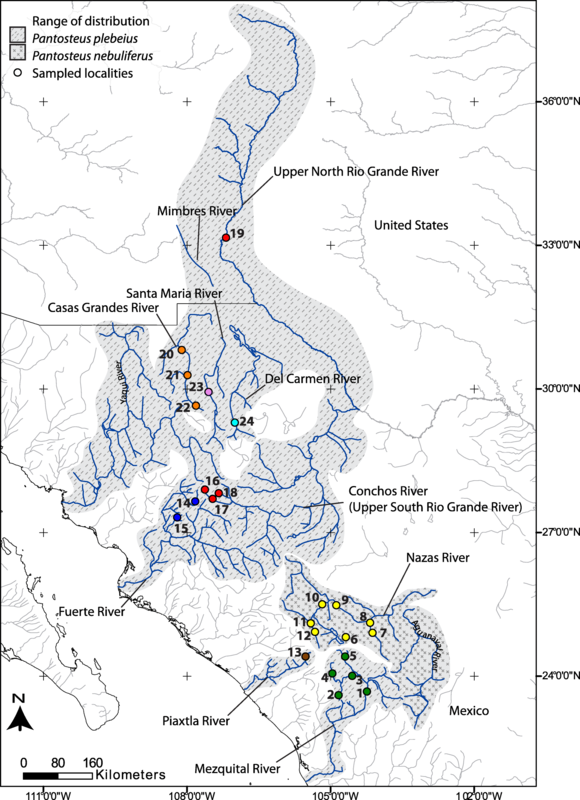 It has been suggested that the populations of some drainage basins could represent one or more independent evolutionary lineages, such as those of the Mezquital, Piaxtla, Fuerte, and upper Rio Grande basin, each displaying significant genetic structure compared with Mimbres and Gila River populations [21, 22]. Given the complex evolutionary history of P. plebeius it has been suggested that this lineage may represent several distinct species, one or more of which may be synonymous with P. nebuliferus . Campostoma ornatum (Girard, 1856) and Codoma ornata (Girard, 1856) are codistributed with the Pantosteus plebeius-nebuliferusc species-group throughout its range. Phylogeographic studies of these species have shown repeated isolation scenarios followed by merge or convergence in response to range expansion (reticulated biogeographic history) [3, 11]. This pattern was related to repeated events of dispersal and isolation associated with tecto-volcanic activities occurring in the SMOC since the early Pliocene, as well as to climatic fluctuations during glacial and interglacial periods. Population structure in Campostoma ornatum and Codoma ornata is reflected in high genetic differentiations among populations inhabiting the drainage basin in the northern SMOC, including the Guzman system, and the Río Grande, Yaqui, Mayo, Fuerte, and Nazas basins [3, 11]. The aim of this study was to 1) examine the phylogeography and reconstruct the evolutionary history of the Pantosteus plebeius-nebuliferus species-group in Mexico; 2) to explore the genetic diversity and structure of the species-group; and 3) determine population divergence times using nuclear and mitochondrial markers. We hypothesize that the genetic structure and distribution of the main clades of Pantosteus plebeius-nebuliferus are associated with the geological history of the SMOC and central Northern Mexico. We collected 87specimens with permission of relevant authorities in July 2013 from 20 localities in 8 drainage basins (Fig. 1 and Table 1) using electrofishing and hand nets. We included 6 samples from 4 localities from GenBank (GU937833, KJ441235 and KJ441237-KJ441240) for a total of 24 localities in 9 basins (localities 14, 18, 19 and 20 in Fig. 1). Despite a considerable sampling effort, we were unable to obtain any specimens from the Aguanaval and Yaqui basins. We obtained fin clips and preserved them preserved in absolute ethanol and stored them at -75 °C. We fixed several specimens in formalin for identification and deposited in the Fish Collection of the Universidad Michoacana de San Nicolas de Hidalgo CPUM, Morelia, Mexico. We released the remaining captured fish alive. We performed isolation of genomic DNA with BioSprint DNA Blood Kit QIAGEN according to the manufacturer’s instructions. We amplified the complete cytochrome b mitochondrial gene (cytb) using the primers GLuDG  and H16460  and the nuclear 3rd intron of the growth hormone copy I (GHI), using the primers GHI3F and GHI3R . We amplified DNA samples by Polymerase Chain Reaction (PCR), using 12 μl volume reactions with final concentrations of 0.2 μM of each primer, 0.25 mM of each dNTP, 1.5 M of MgCL2, and 1 U of Taq DNA Polymerase. The PCR procedure consisted of 2 min at 95 °C followed by 35 cycles of 45 s at 94 °C for denaturation, 1.5 min at 46 °C and 52.2 ° C for primer alignment for cytb and GHI respectively, 2 min at 72 °C for synthesis, and a final extension of 5 min at 72 °C. We quantified the PCR products by electrophoresis on 1.5% agarose gel and submitted to Macrogen Inc. (Korea) and htSEQ Inc (High-Throughput Sequencing, University of Washington, USA) for sequencing. We estimated the genetic diversity within drainage basins for the two gene markers based on nucleotide diversity (π), haplotype diversity (h), and the proportion of segregating sites (ΘS), using the software DNAsp 5.0 . We obtained the genetic p-distances (DP) between populations using Mega 5.2 . A bootstrapping process was implemented with 1000 repetitions. We estimated the genetic structure at the interspecific and intraspecific level of the Pantosteus plebeius-nebuliferus species-group with fixation indices (ΦST) for both molecular markers. We used spatial analysis of molecular variance of geographically homogeneous K groups (SAMOVA) with SAMOVA 2.0  and AMOVA (for K=1 to identify genetic structure without a priori information and the genetic variance explained within population) with Arlequin 3.5.1.3  to define groups of populations (basins) that were maximally differentiated without constraints of their geographic distribution. For both SAMOVA and AMOVA analysis we used 10 000 iterations from each of 100 random initial conditions. We tested for each K value from 2 to 8 in SAMOVA. We applied a Bonferroni correction  to each p-value obtained in the paired test of genetic differentiation. We manually aligned DNA sequences in Mega 5.2 and examined them using chromatograms. We phased GHI sequences with point mutations using DNAsp and applied a test of recombination using a coalescent-based Bayesian method (10 000 replicates) in the same software. We used two algorithms for phylogenetic reconstructions, using Catostomus catostomus as outgroup (GenBank Accession: AF454871 for cytb and GU937824 for GHI). We conducted independent Maximum Likelihood (ML) analyses with RAxMLGUI 1.3.1 [32, 33] for both genes, performing 10 000 bootstrap repetitions and using the evolutionary substitution model estimated with PartitionFinder . These models were General Time-Reversible  + gamma (GTR+G) for the complete cytb and Tamura-Nei  + gamma (TrN+G) for GHI (see Additional file 1). We conducted Bayesian phylogenetic (BI) reconstruction with the software MrBayes 3.2.6 , using the above selected evolutionary substitution model and implementing two runs of four Markov Chain Monte Carlo (MCMC) processes with 7 million generations for cytb and 15 million generations for GHI, sampling every 100 generations in both cases. The difference in chain length was because GHI required more generations to obtain sufficient values of effective sample size (> 200). We evaluated the convergence of the log-likelihood (-InL) values of the two runs, with 10% of reconstructions discarded as burn-in, to construct the consensus tree (σ < 0.005). We used the posterior probabilities obtained based on a confidence limit of 95% (highest posterior density-HPD) to evaluate the support of nodes. We used a incongruence length difference test (Partition homogeneity test)  in PAUP* 4.0b10  to evaluate the significance of conflict among data sets. We used 1000 resampling characters, and performed concatenated analyses of nuclear and mitochondrial data for ML and BI with the parameters previously mentioned. We constructed haplotype networks for both genes using PopART (available at htt://popart.otago.ac.nz) and applying the Median-Joining method . We estimated divergence times by a coalescent-based method using the software BEAST 1.8.0 , based on the described evolutionary substitution model for both genes (see Additional file 1). We used a relaxed molecular clock, using *Beast (including nuclear an mitochondrial data) with Yule speciation tree model. The clock was calibrated using the fossil record (in hard minimum bound for Lognormal distribution), which was located in the root of the Pantosteus plebeius-nebuliferus species-group. This was represented by fossils of Pantosteus asitus, dated from the Miocene-Pliocene (7.5-2.5 Mya) . We conducted another molecular clock analysis using the mutation rate range for cytb estimated for teleosts of 0.76-2.2%/Myr with uniform distribution in BEAST [43–46]. We implemented three independent *Beast analyses, each with 70 000 000 generations, sampling every 1000 generations. After evaluating the posterior parameter values based on effective sample size, and according to the convergence data, using Tracer 1.6 , we discarded 10% of runs and combined the three analyses to construct a maximum clade credibility tree using BEAST modules (LogCombiner and TreeAnnotator, respectively). We performed an ancestral area reconstruction with RASP 3.2, 20160719 , applying Statistical-Dispersal Vicariance Analysis (S-DIVA) [49, 50] and the Statistical Dispersal-Extintion-Cladogenesis model (S-DEC) . In both cases we used the chronograms obtained in BEAST to resample every 3000 samples from the total set to obtain a subset of 70 000 trees. We considered nine areas in the analysis corresponding mainly to the drainage basins sampled The areas included were the basins: A, Upper North Rio Grande (Palomas); B, Casas Grandes; C, Santa Maria; D, Del Carmen; E, Fuerte; F, Upper South Rio Grande (Conchos); G, Piaxtla; H, Nazas; and I, Mezquital. We applied an unconstrained model allowing any combination of geographic range in adjacency matrix with a maximum of five adjacent hydrographic basins, configuring the dispersal rate with the same probability for each population (basin) of the Pantosteus plebeius-nebuliferus species-group. We performed species delimitation tests using Bayesian Phylogenetics and Phylogeography software BPP 3.4  to generate posterior probabilities for two species-delimitation models in the Pantosteus plebeius-nebuliferus species-group,. We used the reversible-jump Markov chain Monte Carlo (rjMCMC) methodology  to implement an species delimitation analysis A10 in BPP using a fixed guide tree (in this case a species tree) for a species-delimitation model assuming four species according with the main clades observed, which was obtained in the divergence time estimation as mentioned above. We provided an additional guide tree for a species-delimitation model assuming two species, where we assigned individuals to lineages defined by recognized species P. plebeius and P. nebuliferus according with the distribution described for these species . We performed an analysis A11 for unguided species delimitation analysis to determine the best species-delimitation model compared to a priori models mentioned above under A10 analyses. Including both molecular markers, we analyze three combinations of parameters for population size (Θ) and species divergence time (τ): In large population size with deep divergences (Θ α=1, β=10; τ α=1, β=10); small population size with low divergences (Θ α=2, β=2000; τ α=2, β=2000); and large population size with low divergences (Θ α=1, β=10; τ α=2, β=2000). We ran the analyses for 500 000 generations, sampling each five generations, with a final burn-in of the first 25 000. We obtained a total of 92 DNA sequences of the cytb gene (1140bp) (Genbank accession numbers: MG203619-MG203705) and 83 of the 3rd intron of GHI (654bp) (Genbank accession numbers: MG203706-MG203869) for Pantosteus plebeius (n = 63 of cytb and n = 49 of GHI) and P. nebuliferus (n = 29 of cytb and n = 33 of GHI) from 22 localities in 8 drainage basins, representing most of the species distribution range . We sequenced 87and 82 sequences respectively for cytb and GHI and obtained5 of cytb and 1 for GHI from GenBank (Fig. 1 and Table 1). We did not detect any significant recombination in the nuclear GHI sequences (p > 0.05). Although the haplotype diversity in all basins was relative high (h = 0.829-0.981) for cytb and GHI, the nucleotide diversity and the proportion of segregating sites were low for both markers (π = 0.001-0.010 and ΘS = 0.0005-0.010) (Table 2). The populations with the lowest nucleotide diversity (π = 0.003) were those from Fuerte basin. The Casas Grandes and Nazas basin populations showed the highest number of haplotypes. However, the number of haplotypes was different in each marker by population as result of the difference in variation that each molecular marker has. The highest absolute genetic distances (AGD) for cytb found between clades were between the Mezquital (Clade IV) and Piaxtla/Nazas basins (Clade III) (DP = 9.2%) (Table 3), and higher AGD than 5% between all clades was observed. Based on GHI the AGD highest distances (DP = 0.9%) were between the Mezquital and Fuerte and Del Carmen populations, and between the Piaxtla and Del Carmen and Fuerte populations. Between all clades AGD distances were lower than one percent. The lowest AGD were observed between populations of Casas Grandes and Santa Maria populations for cytb (DP = 1.3%) and between the Palomas and Casas Grandes and Santa Maria for GHI (DP = 0.1%), both comparisons within the Clade I (Guzman hydrographic system). AMOVA revealed significant genetic structures among populations (ΦST = 0.9028 for cytb; ΦST = 0.6904 for GHI; p < 0.05) (Table 4). The highest genetic structure with SAMOVA was found when K = 8 (ΦCT = 0.8784 for cytb; ΦCT = 0.7460 for GHI, p < 0.05), and each basin was clustered in an independent group, with the exception of one population of the current Upper South Rio Grande, the Conchos population, which was clustered with the Fuerte population. In the case of GHI, no significant genetic structure was observed when groups of populations (basins) recognized for P. plebeius and P. nebuliferus were compared (ΦCT = 0.1707, p > 0.05). High ΦST and significant pairwise values were observed among basins in both molecular markers, with ΦST ranging form 0.461 to 0.968 for cytb and form 0.050 to 0.907 for GHI (p < 0.5) (Table 5). The highest value was observed between the populations of Piaxtla and Fuerte for cytb, while between Piaxtla and Del Carmen populations for GHI. The lowest but significant ΦST was between Piaxtla and Nazas for cytb and between Del Carmen and Santa Maria for GHI. In contrast to cytb ΦST values, no significant ΦST between populations of Santa Maria and Casas Grandes were observed for GHI. The incongruence length difference test did not show significant differences (p < 0.05), indicating that both molecular markers presented the same phylogenetic signal. Bayesian and Maximum Likelihood phylogenetic analyses for the cytb and GHI sequences (see Additional files 2 and 3) and concatenated analysis (Fig. 2) recovered the same topology, with four highly supported clades (main clades). Clade I included samples from the Guzman hydrographic system (Casas Grandes, Santa Maria, and Del Carmen basins) and the Upper North Rio Grande system (Palomas). Clade II comprised the populations of the Fuerte basin and Conchos River (Upper South Rio Grande basin). Clade III, corresponding to the Nazas and Piaxtla basin populations and Clade IV consisted of the population from the Mezquital basin. The same reciprocally monophyletic haplogroups were recovered in the haplotype networks reconstruction for both molecular markers, corresponding to the four main clades obtained by phylogenetic analysis, but differ in the relationships. In cytb, the Mezquital population (Clade IV) is related (72 mutations steps or MS) to the Guzman System/Palomas populations (Clade I), whereas the Nazas/Piaxtla populations (Clade III) are more closely related to the Conchos/Fuerte populations (72 MS) (Clade II) than to the Mezquital population (Fig. 3a and Fig. 3b). The number of MS separating the population of Fuerte from the Conchos River; and the population of Nazas from Piaxtla River, was 3 MS in both cases. We did not include as MS the median vectors or hypothetical haplotypes implied by the haplotype network reconstruction. In case of GHI, the range of MS between clades was 1-2 MS, geographic correspondence was observed, and shared haplotypes were identified between populations that are closely related phylogenetically (Casas Grandes/Del Carmen/Santa Maria/Palomas, Fuerte/Conchos and Piaxtla/Nazas) (Fig. 3b). The global likelihood scores with the highest probabilities were obtained using the S-DEC approach (Fig. 4). However total congruence in ancestral areas predicted was observed between both analyses. The scenario showed by the two models (S-DIVA and S-DEC) inferred an ancestral area (ABCDF) of the most recent common ancestor (MRCA) of the Pantosteus plebeius-nebuliferus species-group formed by the Guzman system, and the Upper South and North Rio Grande (Conchos and Palomas, respectively). From this first vicariant event dated at ca. 5.1-3.9 Mya (HPD ≥ 95%) to the upper Pliocene, a succession of 7 vicariant and 4 dispersal events were identified during the historical distribution of the species (Fig. 4). The species-delimitation model assuming four species was strongly sensitive to low parameter of Θ and τ, showing high posterior probability for the nodes in A10 and was the species-delimitation model in A11 analysis with the highest probability (P=1 S=4) (Fig. 4). The four species supported correspond to the main clades identified in this work for Pantosteus plebeius-nebuliferus (Fig. 2). The model of species-delimitation reducing the number of species to two (P. plebeius and P. nebuliferus) showed low posterior probabilities for the three combinations of parameters of Θ and τ (results not showed). The main forces shaping cladogenetic events in the Pantosteus plebeius-nebuliferus species-group are consistent with geological processes occurring since the Pliocene associated with the formation and evolution of the SMOC, central North Mexico and the tectonic activity of the Rio Grande Rift. Our results revealed that the species-group comprises more than two independent evolutionary lineages with significant genetic structures between them in nuclear and mitochondrial markers, indicating a long history of isolation. 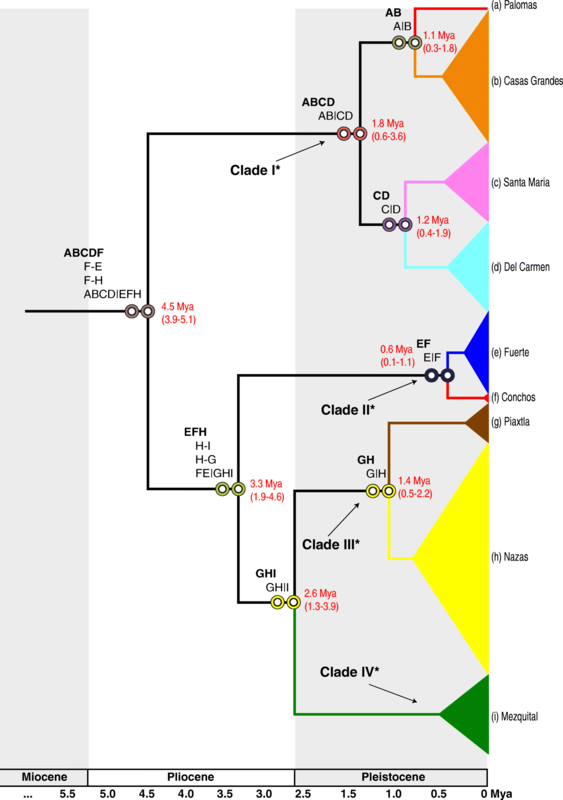 Within clades mitochondrial information showed high divergence and several mutational steps between clades, unlike the nuclear marker that showed shared haplotypes between some basins; and low number of mutational steps between clades, reflecting the combined effects of low variation and incomplete lineage sorting on the nuclear loci . As has occurred with the genus Moxotoma  and Campostoma ornatum , relevant vicariant events and probably river captures may have played an important role in range expansion shaping the spatial distribution of genetic variation in some drainage basins. Genetic variation within drainage basins seems to have been influenced by ecological characteristics of the species and climatic fluctuations since the Pleistocene. Further studies should seek to identify the roles of historical, intrinsic, and anthropogenic influences on genetic differentiation within basins . We dated the most recent common ancestor of all clades of the Pantosteus plebeius-nebuliferus species-group to the Pliocene (5.1-3.9 Mya, HPD ≥ 95%) (Fig. 5), in an ancestral area comprised by the proto-Guzman system, proto-Upper South Rio Grande (Conchos) and proto-Upper North Rio Grande (Palomas). We identified a range expansion of the species-group to the Fuerte basin, which probably resulted from a basin catchment, allowing faunal interchange as proposed for Gila pulchra , and Codoma ornata . These events occurred during the tecto-volcanic episodes in SMOC evolution, including repeated volcanic activity called “alkaline basalt events” [4, 56, 57]. Another dispersal event from the ancestral areas to Nazas was proposed. These events could have been promoted by alkaline basalts events during the Mapimi Bolson formation (Fig. 4 and Fig. 5) [12, 58, 59], which is partially congruent with patterns established for Codoma ornata  and Campostoma ornatum . These dispersal events were followed by a vicariant event that isolated the ancestor of the Proto Guzman system/Palomas (Clade I) ca. 4.5 Mya, associated with the volcanism in the Babicora-Bustillos sector, disrupting the connection between the proto-Fuerte/Conchos and the proto-Guzman systems/Palomas by the periodic accumulation of sediments in the Conchos Valley . This ancient isolation event is reflected in the high genetic divergence between clades I and II in cytb (DP = 6.3-7.0%, ΦST = 0.911-0.938 p < 0.05; Table 3) and in the well-structured haplogroups for both markers (Fig. 3). The split between clade I with respect to the clades II, III, and IV of the P. plebeius-nebuliferus species-group, is geographically, genetically and in some cases temporarily consistent with other co-distributed species complexes of fishes such as Cyprinella spp. , Campostoma ornatum [3, 61], Cyprinodon spp. [6, 62], Gila spp. , Codoma ornata  and Moxostoma cf. austrinum from Conchos . This finding also corroborates the divergence time of the Rio Grande Pantosteus spp. population with respect to the Nazas population in a previous work . The Mapimi Bolson desertification and the alkaline basalt activity at the central part of the SMOC, was likely responsible for the disconnection that promoted the vicariant event of the ancestor of the proto-Nazas/Piaxtla (Clade III)/Mezquital basin populations (Clade IV) from the proto-Fuerte/Conchos populations in the Pliocene, an event that is consistent with results found for Codoma ornata results . Two range expansion events of the species-group from the Nazas to Piaxtla and Mezquital basins following the vicariant event, were found in the same period, which could be the result of river catchments associated with alkaline basalt events in the SMOC [4, 12, 57], an event that is consistent with results found in other aquatic fauna, such as Campostoma ornatum  and semi-aquatic snake species of the genus Thamnophis . Due to the physiographic complexity and the occurrence of several overlapping geologic events in the region of Nazas, Piaxtla and Mezquital, is difficult to identify specific geologic events involved in the cladogenesis of clades III and IV occurred ca. 2.6 Mya. The isolation of the proto-Nazas/Piaxtla from the Mezquital populations possibly had its source in the alkaline volcanic activity occurring in the region during the Pliocene, especially south of Laguna Santiaguillo in the Nazas basin, in the southern region of the SMOC  (Fig. 4) separating the tributary El Tunal (Mezquital Basin) from the Nazas basin occurring in the Late Miocene and Pliocene [2, 65, 66]. The origin and evolution of the three basins within the Guzman system date from the Late Cretaceous and Cenozoic to the Late Pleistocene, and its complexity could explain the species diversity and genetic divergence of fishes in the region. During the Early Pleistocene, the activity of the Rio Grande Rift and the glacial stage (Kansan, Middle Pleistocene)  were likely involved in the fragmentation of the Cabeza de Vaca paleolake and the formation of the Palomas pluvial paleolake, a relict of the Cabeza de Vaca that was fragmented into several endorheic rivers, lagoons, and springs. Among these, the Casas Grandes and Upper Rio Grande basins were firstly isolated from Del Carmen and Santa Maria (ca. 1.8 Mya) by the formation of the Los Muertos Bolson [60, 68–70] (Fig. 5). 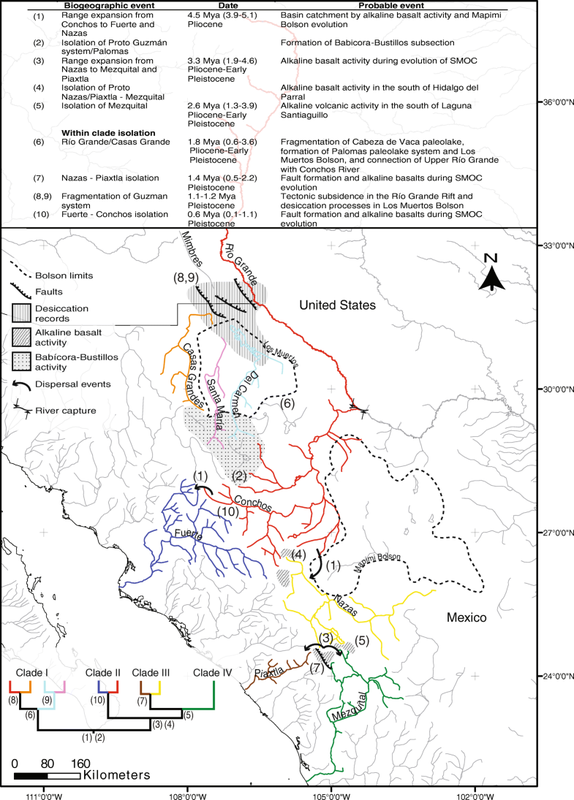 The isolation of the Upper North Rio Grande, including its flow to the Gulf of Mexico and capture of the Conchos River, was dated to the Early Pleistocene [71–74], but the tectonic subsidence in the Rio Grande Rift and desertification of Los Muertos Bolson has continued during the Middle Pleistocene and the present [75–77] allowing the fragmentation of the Guzman system. This paleohydrological pattern is reflected by our data, since we date the isolation of Palomas from Casas Grandes as ca. 1.1 Mya and 1.2 Mya for the isolation of Del Carmen from Santa Maria (Fig. 4). This is also consistent with previous studies that found low genetic divergences between populations of Pantosteus plebeius from the Mimbres River (type locality of the species) and P. plebeius from the Palomas River (Upper North Rio Grande) . The three basins within the Guzman system were isolated and reconnected several times during the Pre-Illinoian, Illinoian, and Pre-Holocene periods [78–80]. Remixing gene pools and low genetic structures also were observed in other co-ocurring fishes along the Guzman basin, including Gila spp. [10, 81] and Cyprinodon spp. [6, 62]. However, the high interbasin genetic distances and the lack of shared haplotypes for cytb is evidence of the ancestral isolation that occurred in Del Carmen and Casas Grandes populations of Campostoma ornatum (DP = 2.9%; ΦST = 0.935) , and the significant genetic differentiation (FST = 0.380) in Cyprinella formosa [60, 69, 82–84] which represents an isolation event that also occurred in the Pleistocene. In contrast, the low genetic differentiation and haplotypes shared among basins for GHI are evidence for the low variation and of the incomplete lineage sorting or a later genetic mixing between these basins. More studies are necessary to explain the configuration of the ichthyofauna of the Guzman system. Finally, the vicariant events involved in the isolation of the Nazas from the Piaxtla and the Conchos from the Fuerte populations, were estimated to have occurred 1.4 Mya and 0.6 Mya in the Pleistocene (Fig. 4), respectively, and are associated with the most recent volcanic eruptions and tectonic movements in the SMOC . This supports the results obtained for Campostoma ornatum , Gila pulchra (Conchos River & Fuerte basin) , and Codoma ornata (upper Conchos River & Fuerte basin)  that show low genetic differentiation as well as shared haplotypes among basins as we observed in the nuclear marker (Fig. 3). A high number of mutational steps and genetic intrabasin distances where estimated for cytb in the Pantosteus plebeius-nebuliferus species-group. 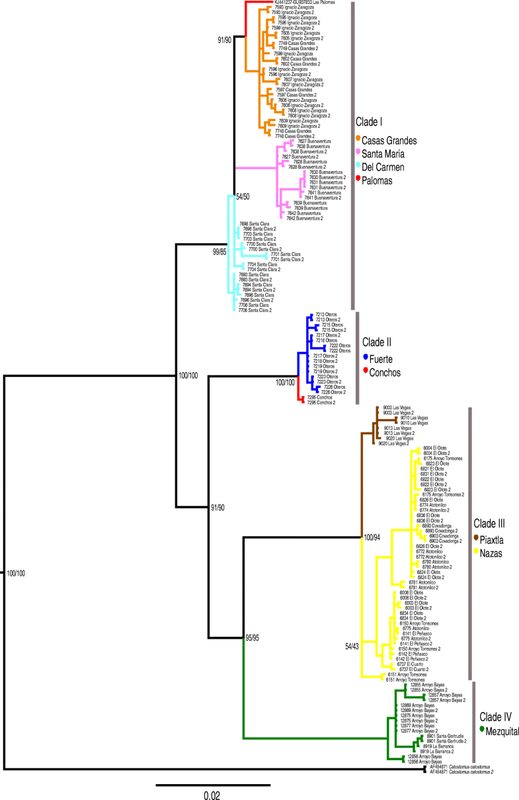 Surprisingly, moderate between-haplotype MS values (MS = 4-7) were found within the Mezquital, Nazas, Fuerte, Casas Grandes, and Santa Maria basin populations than between the Nazas and Piaxtla (MS = 3) and Conchos and Fuerte populations (MS = 3), reflecting considerable genetic differentiation in cytb (Fig. 3 and Tables 3, 4, 5). The intrapopulation genetic structure in those drainage basins could be explained in part by life history traits. Migration episodes associated with environmental fluctuations on spawning sites and food availability have been extensively described in other species of Catostomidae [86–93]. Accordingly, the historic climate fluctuations in the area [94–96] could promote similar fragmentation episodes in P. plebeius-nebuliferus populations, which could be responsible for the isolation of migrants in separate regions within the basins. The Pantosteus plebeius-nebuliferus species-group comprises a set of distinct genetic groups, suggesting that it is composed of at least four clades with unique and independent evolutionary histories. We found cladogenesis to be associated with the high tecto-volcanic activity and climate fluctuations from the Pliocene to the present in North Mexico. This is supported by the phylogenetic relationships, species tree, species-delimitation test including both molecular markers. Also is supported by the genetic divergences observed between clades for cytb (see Additional file 2), which are higher than those reported among sibling vertebrate groups for cytb (~2%) [97–100] and between sister species within the family . In the case of GHI, the genetic distances estimated between species of Catostomidae are 3.3%  taking into account different genera of the family, and which were higher than estimated in this work (Table 3, DP<1%). However, although the nuclear GHI showed a low number of mutational steps and genetic distances (Fig. 3 and Table 3), we detected significant structure (Table 4) and recovered the four clades in the phylogenetic inference (see Additional file 3) supporting the mitochondrial results. The genetic structure and divergences in the species-group were similar to those observed in other fish taxa that partially or completely occur in basins of northwest Mexico and the southwestern USA, such as Cyprinodon spp. [6, 62], Gila spp. [10, 81], Cyprinella spp. [60, 69, 84], or even among populations of other considered species complexes as Campostoma spp. [3, 61], and Moxotoma spp. . Thus, we recommend an integrative taxonomic revision of the Pantosteus plebeius-nebuliferus to recognize the four independent evolutionary lineages as different species. The population of the Piaxtla basin was recognized as Pantosteus plebeius  and suggested as an independent evolutionary lineage , our results show that this population is closely related to P. nebuliferus, as was also demonstrated by . Low genetic divergences between populations of P. plebeius from the type locality Mimbres River and from the Upper North Rio Grande have been observed by other authors [22, 102]. Our results show that Paloma River is closely related with Guzman system populations, thus we suggest that Clade I must be considered populations of the recognized species P. plebeius. The Clade II (Fuerte basin and Conchos River populations) and the Clade IV (Mezquital River population) do not represent populations of any species recognized of the species-group studied, thus we suggest that the two clades could represent two independent evolutionary lineages that must be described and recognized as new species of the genus Pantosteus. The identification of the Evolutionary Significant Units (ESU) is of particular interest especially in species considered threatened . Such is the case of Pantosteus plebeius-nebuliferus species group, which is listed as in danger of extinction in the Norm-059-SEMARNAT-2010 . We identified the group of populations whitin independent evolutionary lineages, which warrant separate management or priority for conservation. Based on the high genetic divergences; number of mutation steps; phylogenetic relationships; shared haplotypes; reproductive isolation and the subsequent absent exchangeability of populations, we suggest nine ESUs corresponding to each basin where the P. plebeius-nebuliferus species-group inhabit: (1) Upper North Grande River, (2) Casas Grandes, (3) Santa Maria, (4) Del Carmen, (5) Fuerte, (6) Upper South Grande River basin (Conchos River), (7) Piaxtla, (8) Nazas and (9) Mezquital. The definition of these nine ESUs should aid in establishing conservation measures of the species-group and of the evolutionary lineages of which they are configured. Our study supports at least four independent evolutionary lineages in the Pantosteus plebeius-nebuliferus species-group. Their biogeographic history is linked to geological events occurring since the Pliocene, associated with the formation and evolution of the SMOC, central North Mexico and the tectonic activity of the Rio Grande Rift. Other freshwater fishes already studied and occurring partially or completely in the same range of northwest Mexico and the southwestern USA have similar genetic structures and divergences. We recommend an integrative taxonomic revision of the Pantosteus plebeius-nebuliferus species-group and propose nine ESUs for conservation purposes which are restricted to individual basins where the species-group is distributed. As an endangered species, we hope our survey contributes to the management and preservation of these fishes. A correction to this article is available online at https://doi.org/10.1186/s12862-018-1321-z. We thank Rogelio Rosas Valdez and Hugo Mejia Madrid for field support in obtaining fish samples. Thanks to Javier Pérez Tris and Silvia Perea for valuable comments, and to the reviewer Tom Jameson from Chester Zoo and reviewers from The Lucidus Consultancy, Alan Pike and Kathleen Hills, for English corrections and suggestions. This work was partial supported by the Coordinación de la Investigación Científica (CIC-UMSNH 2014), the Ministerio de Economía y Competitividad of Spain (grant reference CGL2013-41375-P) and FEDER Spain (grant reference CGL2016-75262-P). Both resources were used to finance fieldwork, laboratory (DNA isolation and amplification of molecular markers) and sequencing service, as well as for the publication of this work. The Consejo Nacional de Ciencia y Tecnología CONACYT with sabbatical grant and the scholarship to ODD (grant number: 260596) and DKCS (number grant: 254270/411621) respectively. We acknowledge support of the publication fee by the CSIC Open Access Publication Support Initiative through its Unit of Information Resources for Research (URICI). The datasets generated and/or analyzed during the current study are included in the research article (and its additional files). Also, all DNA alignments and phylogenetic trees are available via Treebase (http://purl.org/phylo/treebase/phylows/study/TB2:S23572?x-access-code=31a6674c7214877743d545e8ded23145&format=html). All DNA sequences obtained in this work are available on GenBank under the Accession Numbers MG203619-MG203705 for cytb gene, and MG203706-MG203869 for GHI region. All authors contributed intellectually to the work and approved the submission. ODD, RRP, LTM, YHD, ID and DKCS participated in fieldwork. DKCS, LTM and JRPB carried out the work lab. DKCS, LTM, JRPB, ODD and ID analyzed the data and wrote the manuscript. All authors have read and approved the manuscript for submission. This research has been performed within an appropiate ethical frameworks. Field and laboratory protocols used in this study, including sampling procedures, were reviewed and approved by the Mexican Ministry of Environmental and Natural Resources (SEMARNAT), under collection permit number PPF/DGOPA-262/17. Approval by an ethics committee was not necessary because this research did not include animal experimentation, and the samples were obtained using tricaine mezylate (MS-222) in fishes as anesthetic, according with the Official Mexican Norm NOM-051-ZOO-1995 and NOM-033-SAG/ZOO-2014 for humanitarian treatment in the mobilization of animals. Rambaut A, Suchard MA, Xie D, Drummond AJ. Tracer v1.6. 2014. Available at http://beast.community/tracer. Accessed Feb 2017. Unmack PJ, Dowling TE, Laitinen NJ, Secor CL, Mayden RL, Sciozawa DK, Smith GR. Influence of introgression and geological processes on phylogenetic relationships of western North American Mountain Suckers (Pantosteus, Catostomidae). Plos One. 2014. https://doi.org/10.1371/journal.pone.0090061. Gustavson TC. Arid Basin Depositional Systems and Paleosols: Fort Hancock and Camp Rice Formations (Pliocene-Pleistocene), Hueco Bolson, West Texas and Adjacent Mexico: The University of Texas at Austin, Bureau of Economic Geology, Report of Investigations; 1991. No. 198. p. 49. https://store.beg.utexas.edu/reports-of-investigations/1161-ri0198.html.